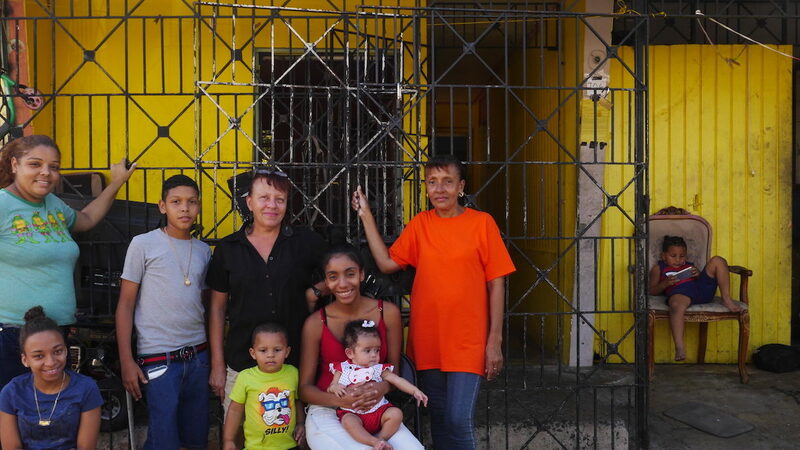 Yolanda Montañez, in the middle dressed in a black shirt, with her family in front of her house. Yolanda Montañez’s home resembles that of a construction site. The floor is bare, with dirt and small holes. There are no walls separating the two bedrooms on the second floor, and all of her belongings are huddled up in plastic bags. But she’s happy because for the first time in almost eight months she can look up and not see the sky through a blue, plastic tarp but instead a new, brown roof. For decades, the people of el Caño Martín Peña, a neighborhood in San Juan, have dealt with some of the highest levels of poverty, flooding, and gentrification in the country. But when Hurricane Maria hit it left Montañez and more than 1,200 members of this vulnerable neighborhood living under blue tarps. Now the government agency that serves this community’s social, economic and environmental needs is at risk for potential cuts to their budget. In the days and hours after the hurricane ravaged the community, members of ENLACE were the first on the ground in el Caño. Those limitations stem from Puerto Rico’s financial status, which like el Caño, was in a state of emergency well before the hurricane hit. The island, which has the population equivalent of Connecticut, has a current outstanding debt exceeding $72 billion, more than almost all 50 states, except California, New York and Massachusetts. There are various reasons why Puerto Ricans are leaving in droves. For some it’s the country’s financial status, lack of opportunity and access to education. But for Montañez, her sister Milagros Montañez and their neighbor Luis Ramos, leaving the island was never an option until Maria — even after years of flooding and inequity. El Caño Martín Peña is a large informal settlement of 26,000 inhabitants originally built on top of mangrove wetlands and is adjacent to San Juan’s Financial District, La Milla de Oro. The residents along the national estuary lack the basic infrastructure to deal with the raw sewage that comes through the channel. Without a proper sewer system, the homes would flood with dirty toilet and sink water years before Maria hit. “The situation with the house after the hurricane put me in a depression and that was the only time I considered leaving this community,” said Montañez, who has lived in el Caño her entire life. In the immediate days after the hurricane hit the island, Montañez and her sister, took refuge at Puerto Rico Convention Center in San Juan, along with thousands of others. When her neighbor Luis Ramos heard the initial warnings about the storm, he packed up his belongings, and left el Caño with his two dogs and one cat. When the residents returned, they found their homes uninhabitable – filled with around two feet of dirty, channel water. Their roofs were completely ripped off. “I spent the first few days in a family members home because staying at home felt like living on the street because it continued to rain for the days following the hurricane,” Ramos said. Yolanda Montañez pudo reparar el techo de su casa ocho meses después de que el huracán María lo destruyera. Part of Yolanda Motañez's family outside her residence. Yolanda Montañez, su hija Yaxyra Rosario Montañez y Danjoinel, hijo de Yaxyra, en la casa de la familia. 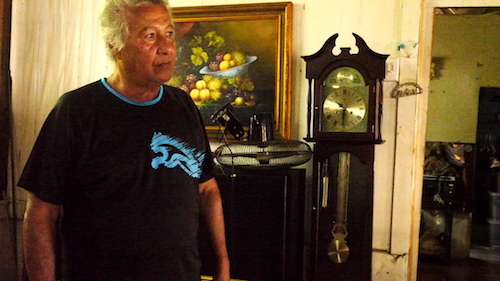 For many residents of el Caño property rights are another obstacle. Most don’t have the rights to the land they and their families have been living on for generations. This means they can not mortgage, lease or sell the land. This issue of informal housing became the most prevalent after Maria, when residents began to apply for aid and were denied on the basis of inability to prove land rights. But despite the endless obstacles, Ramos and the Montañez sisters keep fighting. There are decades of history and relationships that have been built along el Caño. The streets in el Caño are filled with generations of residents. There are kids riding their rusted bicycles, older men playing chess, and an influx of neighbors coming and going, checking in on one another. The only thing that seems to have remained a constant for these residents is their sense of community. In less than a month the 2018 hurricane season is set to begin and the Montañez family and Ramos believe their new roofs will withstand. They are hopeful for the future of their community and Puerto Rico.